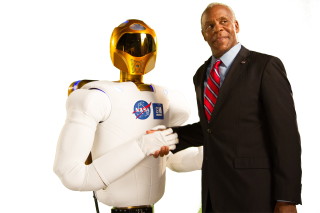 Danny Glover shakes hands with NASA's Robonaut in "Space Warriors" a new movie from Hallmark. Image released Apr. 19, 2013. Space Camp — the dream summer vacation of science-minded kids everywhere — is the star of a new movie from the Hallmark Channel. Since 1982, Space Camp has provided a place for kids to train as Mission Controllers and spaceflyers on simulated shuttle millions. Now, it's the setting for a science-fiction film about teenagers who help NASA save the International Space Station. The movie makes its Hallmark Channel premiere on Friday night (May 31) at 8 p.m. EDT (0000 June 1 GMT), and you can watch a SPACE.com exclusive clip from "Space Warriors" here. Filmed on-site at Space Camp's home at the U.S. Space & Rocket Center in Huntsville, Ala., "Space Warriors" is a fictional story about a group of teens who compete to win a trip to space. Two teams — the Warriors and the Titans — go head to head in challenges designed to test their skills in math, science and engineering to win seats onboard a spacecraft. The kids get more than they bargained for, however, when scientists from the Marshall Space Flight Center call upon the students for help solving a life-or-death problem onboard the International Space Station. Robonaut, the real-life robotic astronaut helper on the orbiting laboratory, even makes a special guest appearance in the film. Some of the young actors in the movie weren't especially interested in space travel before filming, but that changed once they got on set. "Science was always one of my favorite classes in school, and it still is, and everyone wants to go to Space Camp," said 15-year-old Ryan Simpkins, who plays Lacey Myers in the film. "To actually learn about real life space is really fun … Space Camp makes it much more fun and interesting." Families can enter to win a trip to Space Camp through a sweepstakes. Submit your information on the "Space Warriors" website and then look for a "secret keyword" on screen during the Hallmark Channel premiere on Friday (May 31) at 8 p.m. EDT (0000 June 1 GMT). Follow Miriam Kramer on Twitter and Google+. Follow us on Twitter, Facebook and Google+. Original article on SPACE.com.